As an elementary school counselor, I often gave students stress balls, Koosh balls, and other hand fiddlers for them to relieve their nervous energy in class. However, teachers would often take them away from students since they became a distraction instead of being helpful. While 19 million students have ADHD, anxiety disorder, or a learning disability, most students appreciate having a way to move throughout the day instead of having to sit still for 5-6 hours at their desk every day. There are numerous health, academic, and social benefits for students being able to be active learners in school instead of passive learners. Some of the above resources have been very helpful for students. However, all of these resources can become exhausting and over-stimulating to children when they simply need a break to "anchor" or not be moving during the day. 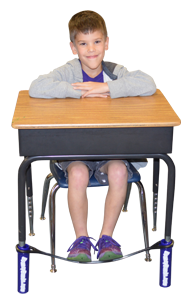 It can be difficult for students to have 2 different seats so they can alternate between having movement and being still. Then came Foot Fiddlers! There are many different ways to help students relieve their extra energy, while keeping their hands free to work. 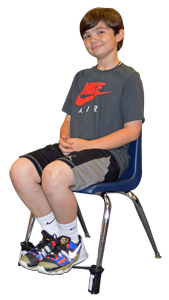 Foot fiddlers allow students the opportunity to receive stimulation when they need some relief and then return to "normal." The different resources vary in price, assembly, and effectiveness. In full disclosure, I invented Bouncy Bands, so they are my favorite. Kindergarten through second grade students love being able to bounce their feet when they need relief from extra energy, anxiety, frustration, or even boredom. 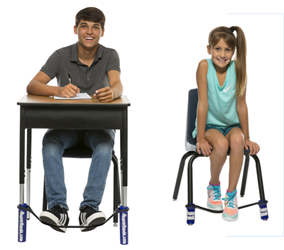 No more dangling feet or leaning back in their chairs.They help students stay focused and behaved in class so they can get more work done. Installs in less than 3 minutes. 2-12th grade students enjoy being able to bounce their feet and stretch their legs to allow some movement in class when needed. Students can do better on tests since they can work longer while being able to relieve their frustration and anxiety. Installs in less than 2 minutes. 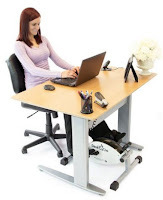 Students and adults can burn calories while they work. A pedometer keeps track of distance pedaled. It assembles in under 5 minutes. The tension can adjust to fit your desired level of difficulty. 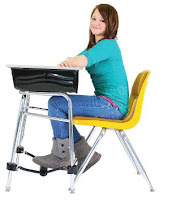 Students and adults can rest and bounce their feet on this padded suspension bar. It assembles with tools in less than 15 minutes and can be adjusted for different heights, depending on the desired height. In the comments below, please mention other resources you have found to be helpful with students. Hey Mate!Thanks for posting such great information and you are doing great work and from now i will come daily on your blog . it is very easy to accidentally aircus.com/ transform the tool on or off if you select it up to relocate while it is connected in Website While running, the PureSpa does generate Feel the Power of Aromatherapy and Relieve Stress by Using Essential Oil Diffusers a distinct electrical bustling noise. It additionally has teespring.com/ a removable tray that is made Click Here use of as a play facility or a meal tray Best Convertible Car Seat Buying Guideli throughout treat time. I like this idea of foot fiddlers. The great paper writing service order-essay-online.net! Fast and professional essay writings! En outre, 41 500 navetteurs arrivent à Stockport asics gel fuji attack femme chaque jour ouvrable d'autres régions, soulignant les bonnes possibilités d'emploi dans ce domaine. Pathfinder 3.0 et Journey 2.0 sont les nouveaux ajouts à la gamme Kelty Child Carrier. Quelque chose que vous n'avez peut-être pas prévu de toute cette folie stogie, c'est un grand nombre des petits facteurs qui accompagnent le air jordan 11 georgetown price tabac à cigares: l'humidor, le cutter et le briquet, simplement pour en nommer certains. Établie dans l'industrie depuis quinze ans en tant que maquilleuse professionnelle et conceptrice de robes de mariées, la collection nuptiale de Minal, Micha Couture, s'étend bien air jordan custom basketball jerseys au-delà des belles robes de mariées. Les cowboys du vieux Ouest ne possédaient pas toujours le chapeau de cowboy sur lequel s'appuyer. Helix Aspersa Muller, comme étant le sérum est scientifiquement identifié, déclenche une ligne d'action orchestrée de remplacement cellulaire concernant les pores dysfonctionnels et sains et les nike air max 1 essential femme noir cellules de la peau. Supplements For Fitness terminal levels. The manufacturers and distributors of dietary supplements now actively join their formulas with prescription or similar drugs fully aware of the dangers they pose to consumers. People who perform these . Ocanna CBD (Cannabidiol) is a non-psychoactive extract of CBD. Get all the benefits of cannabis with none of the side effects. Ocanna CBD Cream is formulated with CBD extract that is organically grown & harvested in the USA. Our full spectrum CBD extract is filtered to remove any THC compounds, ensuring safe and effective delivery of cannabinoids that support overall health & wellness. 100% Natural Formula: Ocanna organic CBD Cream uses only natural ingredients that are toxin free. Ocanna organic CBD Cream contains no dangerous synthetic chemicals or stimulants. No Side Effects: Ocanna organic CBD Cream contains NO THC, therefore you don’t have any of the side effects. THC is the cannabinoid in Marijuana that gets smokers “high”. Fortunately for you the health benefits from from CBD and not from the THC. Lifestyle Benefits: The majority of the scientific community agrees that reducing stress levels can help play a part in a healthier lifestyle. Try Ocanna Organic CBD Cream today!